Volaris reported very weak results for Q4, but the company still has great long-term prospects. Mexican ultra-low-cost carrier Volaris (NYSE:VLRS) is certainly not an investment for the faint of heart. The stock closed at $14.01 on the day of its IPO last September, but it has since slid nearly 35% to $9.21 as of Tuesday afternoon. Nearly half of that drop has come in the last two weeks alone, following Volaris' disappointing Q4 earnings report. Volaris Stock Chart, data by YCharts. While tough competition in the Mexican domestic air travel market caused a steep drop in unit revenue last quarter, Volaris remains well-positioned for long-term success. It has the lowest unit cost of any airline in Mexico (or anywhere else in the Western Hemisphere) and is the No. 2 player in the rapidly growing Mexican air travel market. There could be a lot of ups and downs for Volaris in the next few years as Mexico's aviation industry develops. However, for risk-tolerant investors, Volaris' recent drop represents a potential buying opportunity. Mexico has three relatively young low-cost carriers that are all growing fairly rapidly: Volaris, Interjet, and VivaAerobus. This capacity expansion, combined with relatively weak economic growth, has led to severe price competition. Last quarter, Volaris reduced its fares significantly in order to stimulate demand, causing unit revenue to drop nearly 17% year over year. The average fare reached just $90, making flights very affordable. 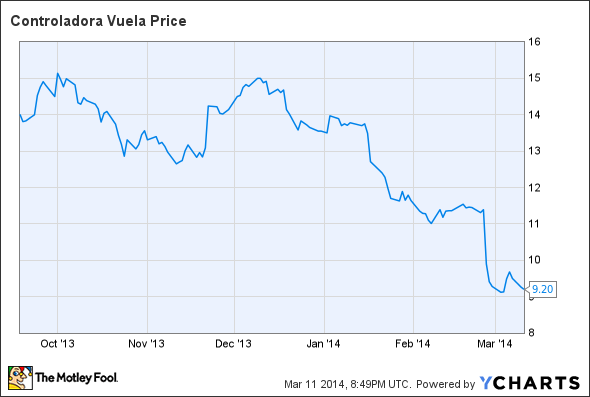 Obviously, this level of price competition is not good for Volaris' near-term financial results. Volaris swung to a small loss in Q4, compared to a profit in the prior-year quarter. However, lower fares are creating new demand. In fact, a recent survey of Volaris passengers found that 6% had never been on an airplane before. Volaris is helping make air travel more common in Mexico. Photo: Volaris. Volaris thus introduced hundreds of thousands of people to air travel just in 2013. As air travel continues to become more mainstream in Mexico compared to bus travel, Volaris should be able to leverage its pioneering position into long-term customer loyalty. This bodes well for the company's growth over the next decade. Volaris is likely to post a significant loss this quarter. Q1 is generally the weakest quarter of the year, and overcapacity on certain routes has continued into 2014. Additionally, Volaris is a leisure-focused airline and so the shift of Easter from March to April will move a lot of demand from Q1 to Q2 this year. That said, demand has been improving relative to last quarter -- through February, Volaris' load factor has risen approximately 1.6 percentage points year over year. By contrast, load factor fell 1.7 percentage points in Q4. Ancillary revenue generation is also starting to improve. Last fall, Volaris implemented a new passenger reservation system, changed its ancillary revenue recognition policy, and introduced some new baggage fees. The net effect was some disruption that drove a drop in non-ticket revenue per passenger. However, ancillary revenue has started to recover this quarter and ancillary revenue per passenger is expected to return to growth in Q2. This will allow Volaris to improve its margins while continuing to attract new passengers with low base fares. The Mexican air travel market is poised for rapid growth in the next decade. As various carriers chase this huge growth opportunity, there will inevitably be more periods of time when profitability lags due to overcapacity. However, low fares will just encourage more people to try traveling by airplane rather than by bus, building the long-term market. Fortunately for Volaris shareholders, Volaris has lower costs than any of its competitors and a strong balance sheet. This means that it has the best chance of coming out on top as the Mexican aviation market matures. Considering the size of this opportunity, Volaris' current market cap of less than $1 billion makes its stock look like a bargain.